As the reports published in Times Of India and other News Papers, Internet will have huge expansion. It is being said that the new domain suffixes to be added. Several companies are looking for suffixes such as .music, .bank etc. Google Inc is seeking for .Google and . YouTube domains. Google also wants Internet address to end with .lol *which is shorthand of Laugh Out Loud. Not only companies and groups, *New York City is also seeking for .nyc. The Organisation behind the expansion is, Internet Corporation for Assigned Names and Numbers (ICANN). It can take more than a year before these new suffixes are ready for use. The ICANN will announce a list and other detail in this respect on Wednesday in London. The suffixes be not be available for all, if suffixes are found to violate the trademarks or is offensive then they would not be available for bidding. Some such as .web, .www etc will not be delayed for bidding as they are easy to remember. 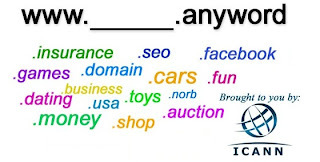 ICANN will encourage the parties for agreement if more than one applications seek the same suffix. Also, if there is no compromise then ICANN will hold an auction.